Cannabis produces phyto cannabinoids in a carboxylic acid form that are not orally active at least at the CB-1 receptor sites, because they don’t readily pass the blood brain barrier in their polar form. 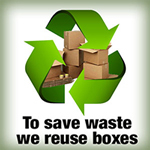 To enable them to pass the blood brain barrier, they must first be decarboxylated, to remove the COOH carboxyl group of atoms, which exits in the form of H20 and CO2. There is another mechanism at play however, which suggests that we need to control the decarboxylation temperatures carefully. When we heat cannabis to convert the THCA and CBDA into THC and CBD, we are also converting THC to CBN at a faster rate. At about 70% decarboxylation, we actually start converting THC to CBN at a faster rate than we are converting THCA to THC, so as you can see by the following graph, after about 70% decarboxylation, the levels of THC actually start to fall sharply. That of course means that the CBN also begins to rise and the medication is becoming more sedative. Thank you Jump 117 for this excellent graph! 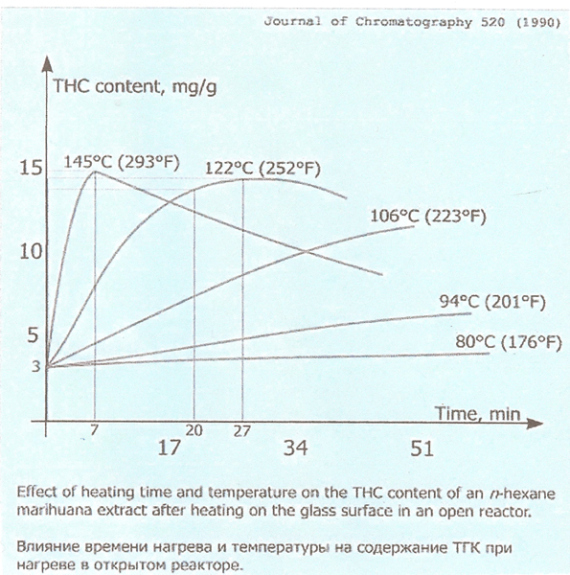 Another fly in the ointment, is that we can never know for sure exactly what the starting state of decarboxylation is, so the times at temperature shown on the graphs are an average. We can’t expect dry material placed in an oven at any given temperature to be that uniform temperature throughout instantly upon placing it in a heated oven, nor know for sure the state of decarboxylation by simple observation. Decarboxylating plant material, also alters the taste (roasted/toasted), which some find less agreeable, and of course decarboxylating also evaporates away the smaller Monoterpenes and Sequiterpenes alcohols, phenols, ketones, aldehydes, ethers, and esters. The good news is that it is dirt simple to monitor the state of cannabis oil decarboxylation placed in a 121C/250F hot oil bath, because you can watch the CO2 bubble production. Just like the curves suggest, CO2 bubble production will proceed at its own observable rate. By keeping the puddle of oil lightly stirred on the bottom and in the corners of the pot (I use a bamboo skewer), so as to keep the bubbles broken free and floating to the top, you can tell exactly when the bubble formation suddenly tapers off at the top of the curve. That is the point that we take it out of the oil for maximum head effect, and we leave it in until all bubbling stops, if we want a more sedative night time med. 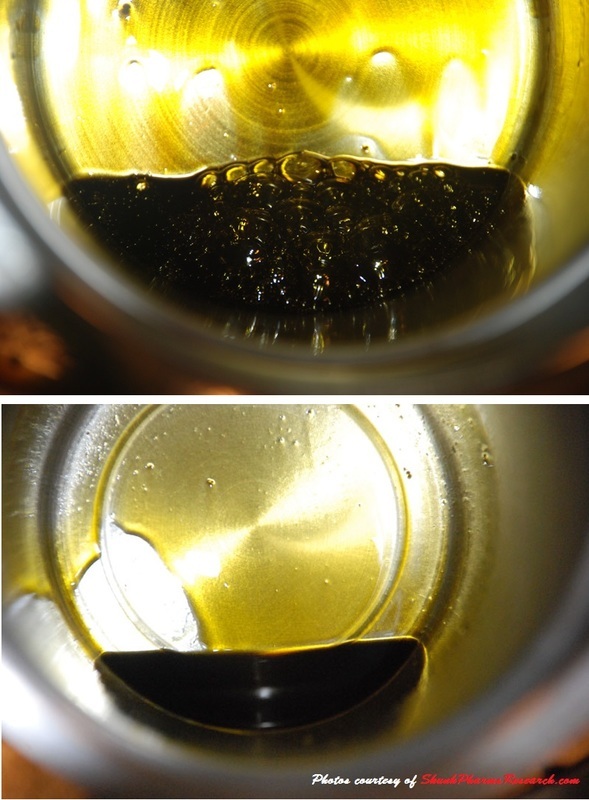 Here are a couple pictures of what oil looks like when boiling off the residual butane. Residual butane or alcohol produces larger, randomly sized bubbles, and is fully purged, when they cease. I am seemingly missing the middle picture of the CO2 bubbles, so I will add it later, but the second picture shows what fully decarboxylated oil looks like.